Already have the Petrel* E&P software platform? Now you can take advantage of DUG Insight’s intuitive interpretation platform and advanced visualisation, using your data directly from Petrel. Forget complex middleware with inscrutable interfaces; connecting the Petrel Link is literally a two-click operation. Then choose from any of your 2D and 3D volumes, horizons, faults, and wells – they’ll appear instantly in your Insight project. Data is fetched from Petrel on-demand, or you can make high performance copies in your Insight project, for use without Petrel. The link is bi-directional — it’s now just as easy to push data into Petrel as to pull it into Insight. 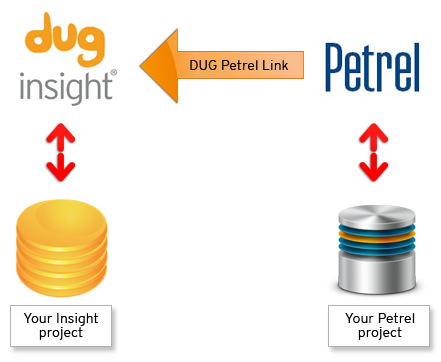 The Petrel Link for DUG Insight supports Petrel 2011-2018. Because this is a link to Petrel itself – not a direct reader of the Petrel data – Insight and Petrel must run on the same computer, and Petrel must be running with the relevant project open while the link is engaged. Of course, if you make a copy of the object in the Insight project, the link to Petrel can be closed.